To sign up for Google Plus, you must first log into your Google Account. As of this date, signing up for Google Plus is no longer on an invitation basis. It is now open to the public (anyone with a Google or Gmail account can sign up for G Plus + network).Before this, you had to join Google + social network only when you were invited. The social network is still in beta stage and testing and you may encounter known issues that are being ironed out to give you a wonderful user experience. 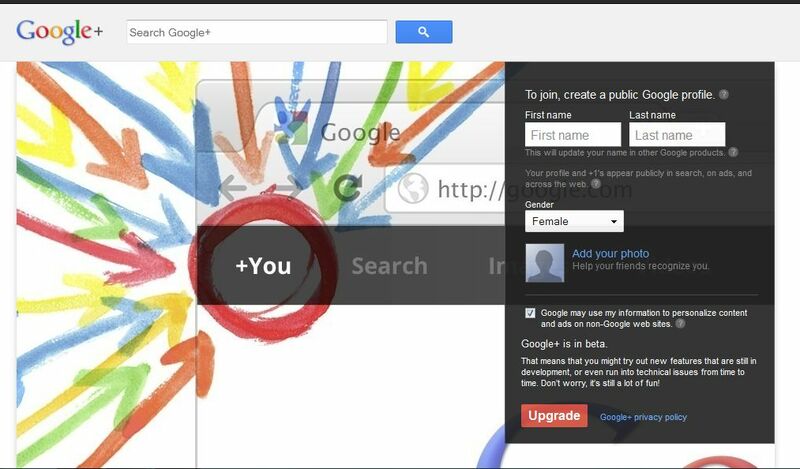 When you have created your Google Plus Profile, you can begin to invite your friends and add them to your circles. A Google Plus Login is very easy and straightforward.Basically, if you have a Gmail Account, you can log into Google+ by using your Gmail password. Google has made it easier to use their products by allowing a single login to access all your Google products. With only one Google Account, you can log into Google Plus, Blogger, Adsense, Gmail, iGoogle and other products. In simple terms, a Gmail sign in is a Google Plus sign in. The Google Plus Social network allows you to create circles, pages, share photos and play games. You can chat, search, like a page (+1) and join a hangout. You are able to change your account settings and above all, you can connect with people and expand your network. Google Plus “Circles” is a term used to describe how you classify your connections. You classify your connections by putting them in different groups (circles).As an example, you can create a circle called “best friends” “work mates” “club friends” “relatives” “class mates” “bloggers” etc.You can clearly see how this classification helps you to identify people with similar interests. You can also identify relationships that you share special information with. As an example, you can share your secrets only with “Best Friends”, work-related matters only with “work mates”, club events only with “Club Friends” and class projects only with “class mates”. This way, you can keep track of events and posts by connections that you are following. You can also choose to show or hide your personal information in different circles. 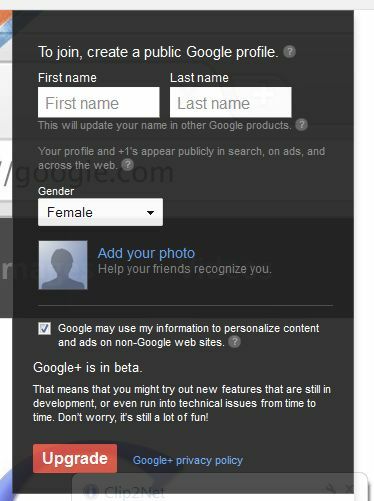 Your Google+ profile includes details such as location, contact info, employment history, relationship status and educational background. Each one of these details can be hidden or shown to people in different circles. As an example, you might want to hide your relationship details from your “work mates” circle and show the same details to your “Best Friends” circle. Google Plus gives you suggestions of people you may know allowing you to decide whether to add them to your circles or not. Google+ gets these suggestions from Google accounts that you are linked to, for example Gmail, Extended Circles, Profile Links and other products. These suggestions appear next to the stream. When you see a suggestion that you may know, you can click the “Add” button near the suggested name to add the person to your circles. To remove suggested names of people that you don’t recognize or know, click the “X” that appears over the name when you hover with your mouse. Suggested “friends” can also be viewed on the [Find People] tab. To see all the suggested names click “Show All”. When someone has added you to their circles, you will receive a notification. You can add anyone to your circle but it does not give you complete access to that person’s profile except his or her name. By adding someone to your circle, you are also able to comment on his or her posts as well as share content with that person. There is a feature to block people whom you don’t want to interact with. You can also change the settings to limit the number of notifications that you receive. The circles that you belong to are not revealed to your connections as well as to people in your circles. You can only see the names of people that you share content with. People who add you to their circles as well as people in your circles will show up beside your profile. You can only see their names and picture profiles. You can play games on the Google Plus social network. To get started, go to the Games page and check for game invites, updates as well as games that are being played by your friends. You can also check for recently played games. Hangouts are a cool feature that allows you to “hang out” with other people online. They are essentially live video chat rooms where you can meet and chat with people who are online. They can also be used to discuss and manage projects online with your team. You can also use them to start conversations with people in your circles. – Go to the Google Plus Login page [http://www.google.com/profiles/me] and sign in. – Choose the right category for your Google+ Page. There are 5 types of categories to choose from namely, [Local Business/Place], [Company/Institution/Organization], [Arts/Entertainment/Sports], [Product/Brand] and [Other]. – Finally click the “Create” tab and you now have a G+ Page. – Follow instructions to set up your profile. – Recommend your new page to your connections. – Click the “Spread” link on your Page Stream to promote your page to many people. – You can now add a new picture to replace the existing one. You can upload your photo from different platforms i.e. you can upload a photo from your desktop, you can upload a picture from your Google Plus albums, you can use tagged photos [Photos of You] or you can use a webcam to take photos of yourself. Whichever photo you select, choose [Set as profile photo] to add it to your public profile. – If the photo is not the right size, you can crop and resize it by dragging its corner. Click [Set as profile photo] when you are done. The public profile photo on your Google Plus account should be a genuine photo of you. You are not allowed to upload a fake photo or someone else’s photo. – Upload a photo from your computer or any source. As soon as you finish adding your profile image, you can post a status update that can be shared with any people you choose. All profile pictures are stored in the Profile Photos folder. Google+ allows you to take pictures from the webcam and you should have Adobe Flash Player installed. You will be prompted to “Allow” or “Disallow” Google Plus and you should select “Allow”. Go to the Flash Player settings and tick [Remember] then select [Allow] to stop the prompts or pop ups. – Click [Edit Profile] then go to any section you wish to edit i.e. Employment History, Education and Location. You can switch between multiple Google Accounts through Google Plus. Click the Google Plus Login link [http://plus.google.com/] and sign in. On the Google Bar click your Gmail address or name. Select [Switch Account] or [Sign into another Account] on the drop down list. Choose the Account that you want to switch to and log in. Google Plus is available in more than 40 languages including English, Chinese and Spanish. You can set your preferred language by logging into your Google+ account. – Go to [Account Settings] > [Language tab] > then select your preferred languages. Your Google content will be translated into any languages on your preferred list in order if your main language is not available. The content you share and upload on Google+ is stored in the cloud. This includes pictures, contacts and posts.However, you have the option to download the content to your computer. There is a back-up solution that allows you to export your data from your Google Profile, Stream, Contacts and Picasa online photo storage. To download and export your data, you must use Google Takeout: Go to the URL google.com/takeout You may be asked to confirm your password as a security measure. – Go to [Account Settings] > [Data Liberation] > [Download Your Data].You can also download data from a selected service instead of downloading all data. Google+ allows you to search for posts, trends and people on the Google Plus network. The search can also be extended to the web. Just like Google Search, Google Plus Search will give you suggestions as you type in your query. You are able to search for posts that you have shared with others on the network as well as posts from the public. You can filter your Google+ searches to 3 categories – People, Google Plus Posts or Sparks. Sparks is content that is currently trending on the web. You can also search content by time or popularity. The Google+ Search bar is on top of the page.